The London Loom is a weaving studio in Hackney in East London. Created by Francesca Kletz and Brooke Dennis after tiring of their work in education and fashion. The London Loom was founded to build a community of people who love making things with their hands and appreciate how good it is for you. 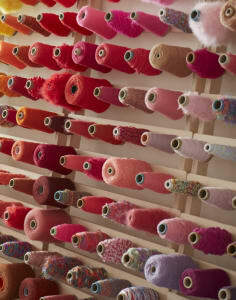 At The London Loom we want to encourage people to indulge in creating for pure satisfaction and fun. We hold community workshops and smaller classes in our studio where we welcome adults and children to work alongside each other; we believe that creativity and inspiration can come from anywhere, it’s not limited to age or background. Ultimately we want to share the good that we feel from learning new skills and making beautiful, tactile things. We teach and host a range of ‘alternative craft’ classes as well as our beginners weaving classes, as long as there’s something to make, new people to meet and obnoxiously loud laughter to be had, we’re happy. The class was very good. The technique was easy to learn, and the environment inspirational. The teacher was good, but it would have been better if she had distributed her attention more evenly. She talked with the same few people all evening and, apart from going round once to ask how everyone was doing, she did not make any other connections. Except for this I would recommend the class. Two hours is the perfect amount of time and my mum really loved the experience. Very relaxing and creative. Had a lovely time with my friend visiting London. There was a mishap with timings but otherwise a great workshop! Really fun and relaxing. Nice to have 2 teachers on hand. Nice relaxed vibe, you can come and go as you please (I was on 5 hours) and the studios are nice with good cafe for lunch in the sun. Plan to return for 2 hour session to do some person Xmas presents. Only regret is wish I had been braver earlier on in my session rather than being so cautious. Class was fun, the teachers are entertaining and location is very pretty. The only problem is that there was not much theory involved with the Japanese embroidery. I was excited to go to the class and hoped the theory would be included, but there was not much history about the tradition or Japanese practice. The instructions were clear and easy to follow. Teachers used prepared kits. Time flew in the workshop with Elizabeth Pawle; there was so much fun to be had. I’ve now completed my project and very happy with the results – thank you. Excellent workshop, lots of lovely materials provided, and a super creative environment to craft in! Will definitely be back. Really friendly welcoming hosts, fun workshop, great location with a lot of choice of wool. Depending on how quick you are you can go home with several pairs of earrings, bag charms or pom pom decorations! Lots of fun! Hosts were great and really enjoyed what they do. Starting the evening with a shot definitely got the creativity flowing! Great atmosphere, funny teachers and beautiful venue. I enjoyed it immensely! I would go again, or grab a more advanced class. Francesca and Brooke of The London Loom offer a friendly, laid back atmosphere to learn a fun skill. I enjoyed my time a great deal embroidering my badge – thank you. The class was super fun - Beth, who taught; was very knowledgeable and clear, and patient. Francesca and Brooke were also really helpful and encouraging and made us giggle a lot. I can't wait to go back! I have always wanted to try my hand at weaving. I had a such a great time - much recommended! Thanks London Loom 😍 the weaving class! The course was fantastic! You got free hands to choose the yarns you wanted which was great and the selection of materials was good.